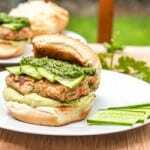 This Bubba Veggie Burger with Cilantro Parsley Pesto and Avocado Hummus recipe is both Gluten-Free and vegan. A delicious blend of the vegan flavors, all in one burger! This post brought to you by BUBBA Burger. The content and opinions expressed below are that of AvocadoPesto. I am all about the veggie burger. Outside of those few years in my childhood where I naturally only craved hamburger loaded McDonald’s happy meals, I’ve pretty much been living a traditional beef burger free life. I mean come on, really though, what good could the meat possibly be if they’re selling those burgers on their dollar menu. Right? I gave up on beef a few years ago and have never missed a steak of hamburger, ever. It’s just too heavy, those beef loaded burgers. Too thick, too dense, too much. 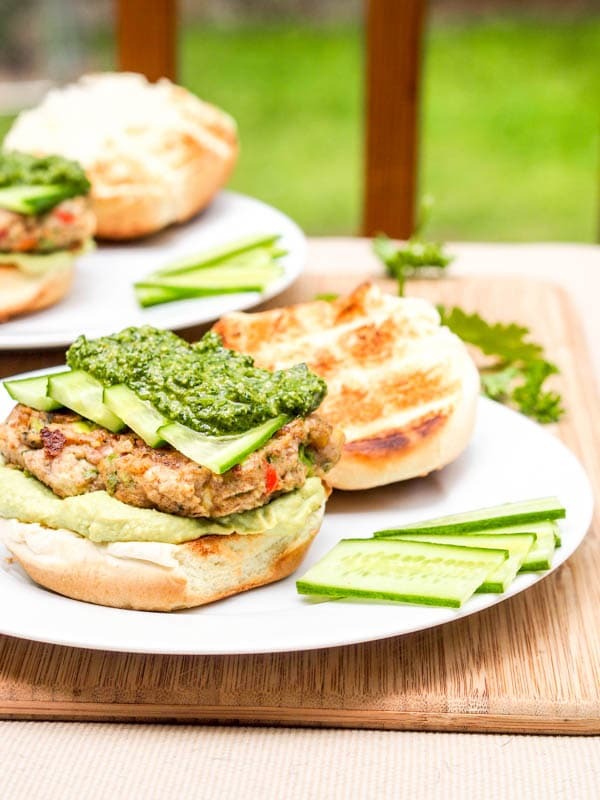 Who needs that, when you could instead be eating delicious and nutritious veggie burgers? Are ya with me? In the last couple years I started experimenting with my ever own veggie burgers creations made from scratch. Once I made them for the first time I was hooked. There are so many different possibilities for flavor combinations, ingredients, textures, densities, you name it. You can use veggies, fruits, nuts, seeds, grains, spices, herbs, – so many options. So when Bubba Burgers approached me, offering a chance to sample their new BUBBA Veggie Burger I was thrilled. And these aren’t your average veggies burgers. You can literally actually see the bits of food right in the patties themselves, which I love. If it’s made with real food, and real ingredients I don’t need it perfectly pulsed, let’s leave some bites whole, so you can get a full on taste of a little black bean, a corn kernel. And the Bubba Veggie burger patties are not uniformly shaped, in that round cookie cutter mold that I’ve seen with most other burgers. 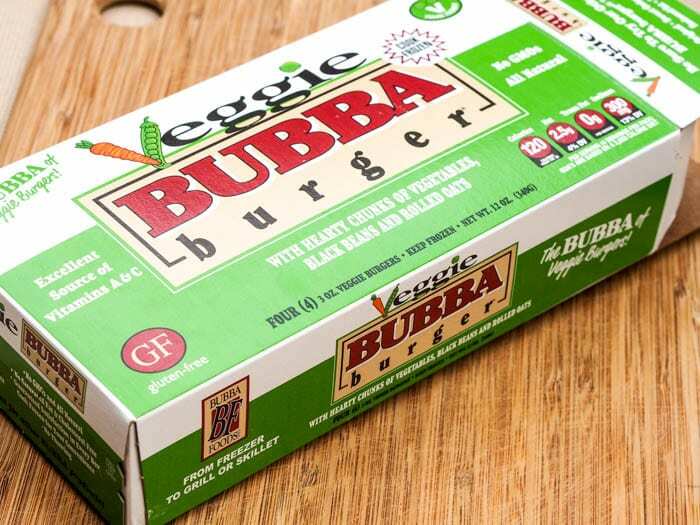 These Bubba veggie burger seem to have a bit of personality – each patty was shaped every so slightly differently and this makes me feel like it was made with love, by hand. You can image yourself making these. By looking at the ingredient list I found black beans, oats, flax seeds, celery, apples, peppers, carrots, broccoli, corn, potato, peas, edamame, and lots of herbs and spices. With each burger patty providing 25% of your daily intake of Vitamin C, 20% of your Vitamin A, 8% iron, 4% calcium, 16% dietary fiber, 4 grams of protein and only 4% of your daily total fat, these sound like a pretty good deal to me. They are both gluten-free and vegan, with no GMO’s, no saturated fat, and cholesterol free. They are sold in a box with four patties and best of all you do not even have to defrost them! Bubba burgers prides itself on maintaing all flavors without have to be thawed. You can just pan fry or grill them straight from the freezer. Now for last minute meal that is seriously a huge bonus feature. As for what to serve this Bubba veggie burger with, I quickly whipped up a cilantro and parsley pesto and an avocado hummus. Did I tell you I now have fresh herbs growing in pots on my deck? With the warmer weather coming along everything is growing perfectly and since I fully exhausted my basil supply last week with a big batch of pesto, this time around I decided to fuse cilantro and parsley into one. With the addition of lime juice, garlic, walnuts, olive oil, hemp seeds, nutritional yeast and of course the food processor to do all the work this vegan and gluten-free pesto was ready in minutes. Without even needing to wash the food processor in between afterwards boxing up the pesto, throw in the chickpeas, avocado, garlic, water, lime juice, olive oil and tahini to whip up some fresh vegan and gluten-free hummus. I love making pesto and hummus from scratch — especially back to back so no extra washing of the food processor required. The herb based pesto packs in a real punch and the avocado hummus is smooth and creamy with being overpowering. With some thinly sliced cucumbers these were the perfect accompaniment to the Bubba Veggie burgers, all sandwiched between lightly toasted burger buns. A delicious vegan meal that you can literally make at the last minute. 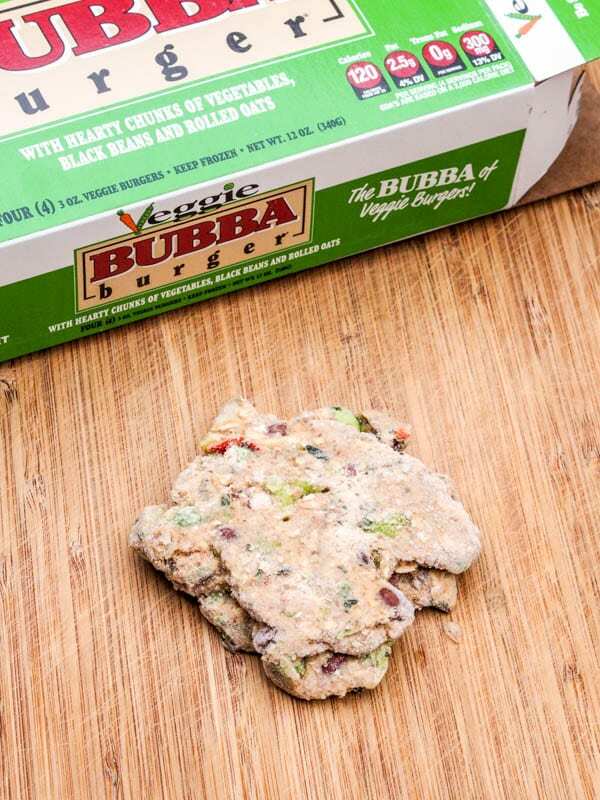 The Bubba veggie burger patties are soft, with bits of the whole ingredients right in the patties. They are light and perfect for a nutritious summer meal. I’m all about the healthier lifestyle choices and these veggie burgers fit right in. 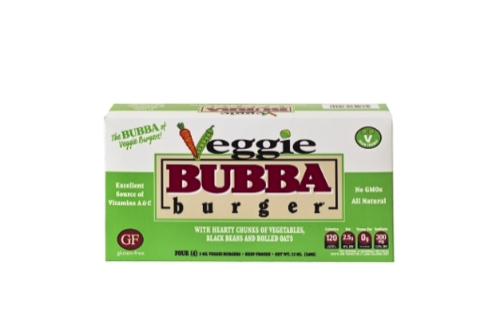 Like BUBBA Veggie Burger on Facebook! 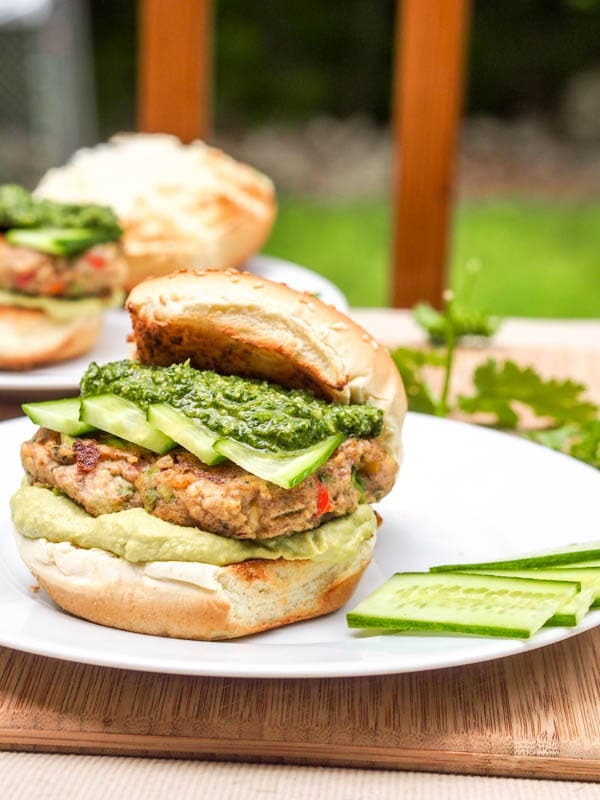 A light and delicious veggie burger with a home made vegan cilantro and parsley pesto and avocado hummus. No thawing needed. Perfect as a last minute meal. In food processor combine pesto ingredients except for the olive oil. Pulse on high, slowly adding the oil through the feed chute. Scrap down the sides if necessary. Process until smooth or desired consistency is reached. Remove pesto from food processor and place in a bowl. In a small bowl combine 1/4 cup water and 2 tablespoons lime juice. In a separate bowl whisk 1/4 cup tahini with 2 tablespoons extra virgin olive oil. In food processor combine chickpeas, avocado, salt, and garlic. Process on high until chickpeas and avocado broken down and almost smooth. Through the feed chute add the water lime mix and process for 1 minute or until smooth. To the feed chute add olive oil tahini mix and process until smooth. Heat 1 tablespoon olive oil in large pan and cook veggie burgers for 4-6 minute on each side. Toast the burger rolls in a toasted. 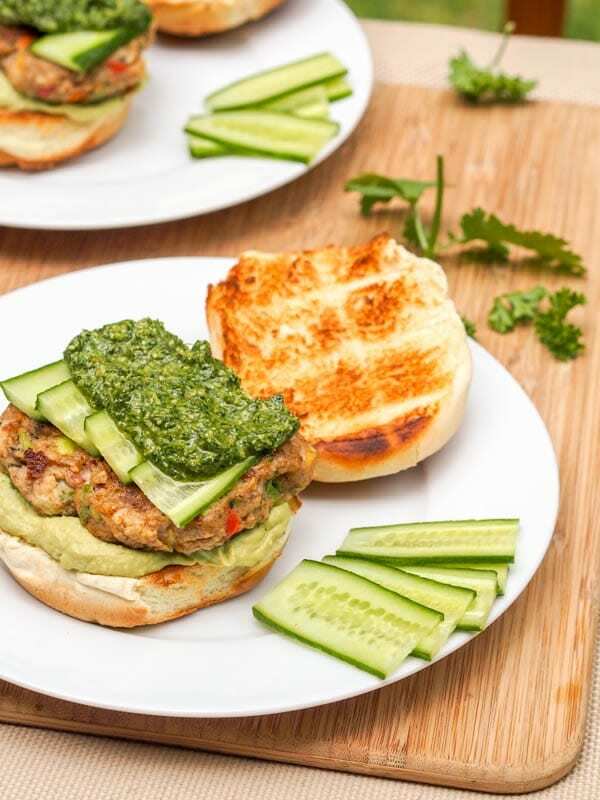 Spread 1-2 tablespoons of hummus on the bottom roll, top with the burger, add cucumber slices and 1 tablespoon of pesto. Top with burger roll. Optional - add spinach or romaine lettuce leaves. Serve remaining hummus and pesto as a dip. I would love to try making this!